My name is Jud, but most folks know me as Generikb the Gaming Hermit! I've been providing daily, family-friendly entertainment on YouTube for nearly 6 years! I grew up watching shows like Mister Rogers, who was a major influence on me (and still is to this day!). Knowing that I'm now entertaining, educating, and influencing so many people with my videos...it's the greatest feeling in the world, and I hope I'm still doing this when I'm 100 years old!!! I've started this Patreon for two reasons: To build a stronger community with my fans, and to reduce my dependency on YouTube ad revenue to earn a living. As a YouTuber, I have no way to identify, interact with, or reward the awesome people who support me...and some of you have been Hermits for years! Patreon gives me all the tools I need to do just that, and I couldn't be happier to finally be able to get back to *my* roots and hang out with you guys! YouTube ad revenue has become very unstable...some months it will drop by 50% or more! This forces creators to focus on content that will grow their channel ("trendy" games, clickbait gameplay, etc) instead of focusing on what matters...creating content that their community of fans will enjoy! Check out these awesome Patreon rewards! 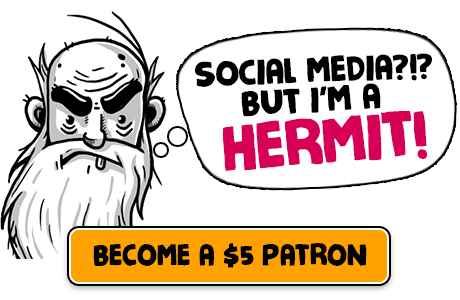 $1/month: Become an Ad-Free Hermit!!! For the price of a taco, you're helping me reduce my dependence on ad revenue! Come chat with me and see exclusive updates, just for patrons! Every patron gets EARLY ACCESS to my videos right here on Patreon!!! Have that warm fuzzy feeling inside your belly, knowing that you're a really awesome person! BONUS: Corny jokes and cat pictures delivered right to your Twitter feed! Come hang out with me in my private Discord server to chat and make new friends! Join my private game servers (Currently playing Unturned) and play with me and other patrons!! A special "Hermit Gamer" rank on my private Discord server, plus separate text & voice channels to use while playing on the Hermit Game Servers! $50/month: VIP Hermit Hall of Fame!!! You've gone above & beyond to help me, and I want the world to know how awesome you are! A special "VIP Hermit" rank on my private Discord server, plus separate text & voice channels to hang out in. Ooh La La...so elite! If you are contributing this much to support me...you're amazing, thank you. I don't have much money, can I still become a Patron? You bet! Even $1 per month helps me reduce my dependence on ad revenue. But remember, only donate what you can easily afford! Can I stop donating in the future if I can't afford it? Absolutely! You can log in to change or cancel your pledge at any time. I won't even cry or nothin'...I'm a big boy! I still have questions before I sign up. If you have questions about the Patreon site you can send them a message by clicking here. If you have questions specifically about my page, the rewards...anything at all...you can send me a message by clicking here! The equivalent of watching over *300* of my videos! It may not seem like much, but just $1 *really* helps end my dependency on Ad revenue. Use your favorite Ad-Blocker on my videos with my sincere thanks! 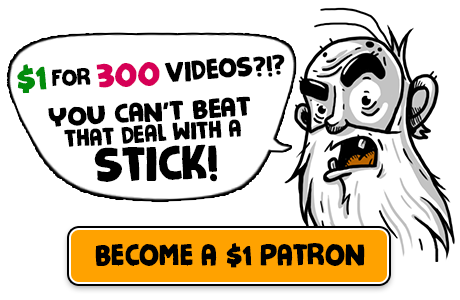 PLUS you get EARLY ACCESS to my videos right here on Patreon! Early Access to my Videos!!! All rewards from previous tiers! I'll follow you on Twitter! Now we're talking...literally! Come hang out with me in my private Discord server to chat and make new friends! 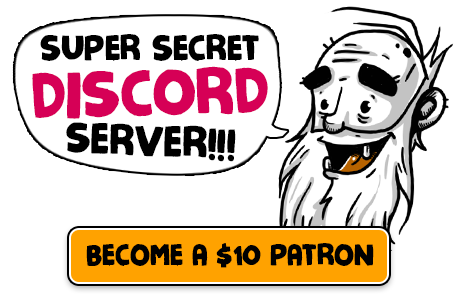 You'll get access to my private game servers, where you can play with me and other patrons! Currently, we are playing Unturned! Game servers & Discord ranks! VIP HERMIT HALL OF FAME!!! Some folks go above & beyond to support their favorite content creators, and I feel like I should go above & beyond to thank them! You'll be honored as VIP rank on Discord, your name will be proudly displayed as a supporter on *every* video I upload, and best of all...I'll use your name* whenever possible for characters in the games I play! I'll name in-game characters after you! VIP Generikb Discord server access and rank! Your name at the end of my vids as an official Generikb sponsor! Seriously, if you are contributing this much to support me...you're amazing, thank you. If you're ever in Bulgaria we'll have lunch at Señor Taco, the best (and only!) Mexican food joint in Sofia! 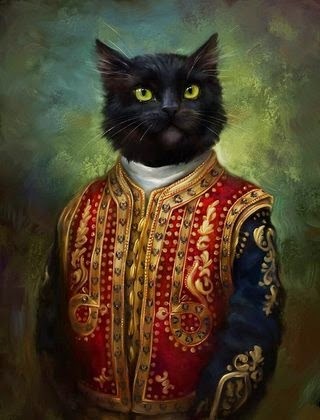 I'll memorialize my two favorite kitties, Bootie (rest his soul) and Rasputin, with custom oil paintings making them look like decorated soldiers and/or royalty!